Bacon. 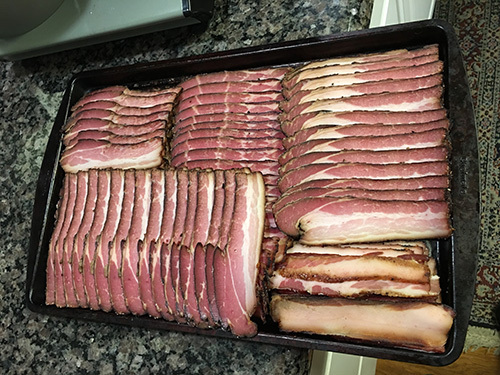 My neighbor and teammate, John, and I have been curing and smoking a bunch of bacon this winter. We have done bacon using commercially available seasoning/cure packets, tried and true recipes, and a few adaptations of our own. We have smoked them on the Big Green Egg, Grill Dome, and even in Char-Broil's Digital Electric Smoker. 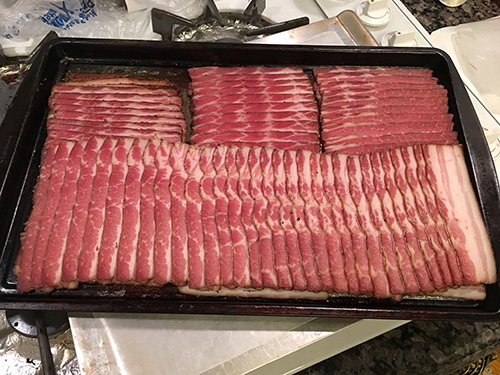 The "least-good" (can't say "worst" with home cured bacon) was the pre-made seasoning packet that we bought but it was still better than store bought. 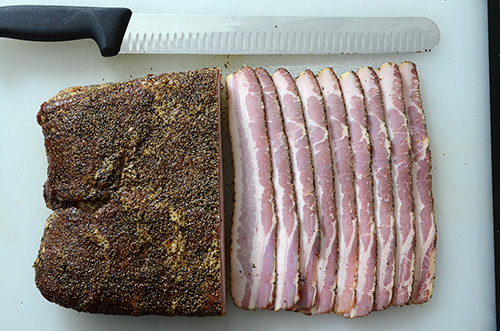 Why does home cured taste better than commercial bacon? To cut costs and maximize profits, most bacon processors shrink the curing process to just a few brief hours and it's packed the same day. Commercial bacon is often made by injecting brine with a battery of hypodermic needles or sliced and bathed in a quick brine (McGee 175). Not all processing operations take those shortcuts. For example, local ham and bacon producer, Allen Benton, cures his bacon for weeks and cold smokes it in a smokehouse for at least 48 hours. Then again, that's why his bacon is world famous and found in some of the most exclusive restaurants. 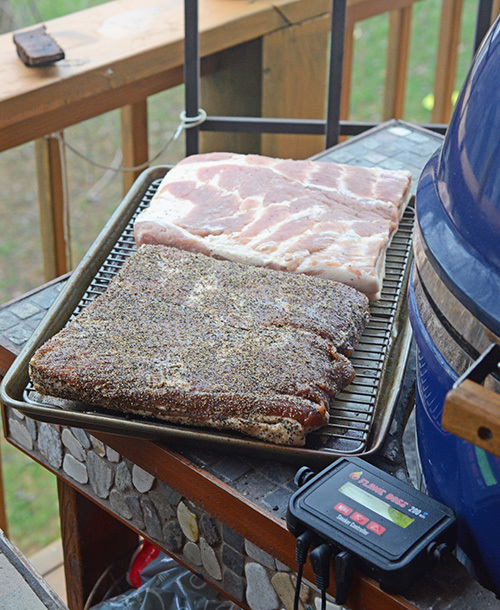 So here's how we cure and smoke our bacon on a kamado grill. Regardless of the exact recipe, our process has been pretty consistent. 1 - Find or order Prague Powder #1 aka "Pink Salt"
This can be the most difficult part of the process. First, pink salt is NOT the pink Himalayan salt that has become popular these days. It is a 6.25% mix of sodium nitrite and often referred to as Prague Powder #1 or Instacure. You might be able to find it locally at big box sporting good stores but in most cases you are over paying for a small quantity. Usually you can buy a larger batch online for about the same price. We paid about $10 for a kit that does 25 lbs of meat at a sporting good store (only place we could find it in town) but got enough to do 100 lbs of meat online for $7.97. You definitely want to follow a road map with curing your own bacon or you could cause food safety issues. 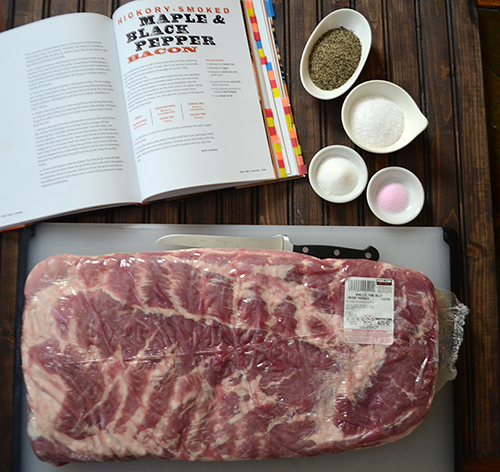 Meathead of Amazing Ribs has some excellent bacon recipes and gives you ideas for varying them. His simple bacon is basic but simple is what Allen Benton uses - curing salt, brown sugar and pepper. 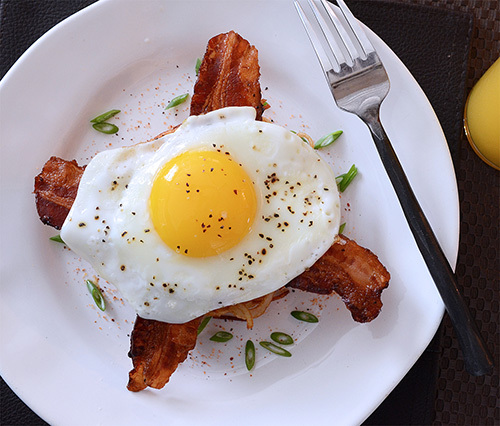 We also really like Meathead's maple bacon recipe doctored up with bourbon. 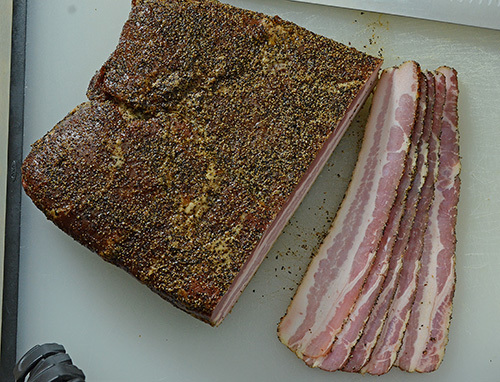 One of my personal favorites is Maple and Black Pepper Bacon from Chris Lilly's 2014 book, Fire and Smoke - A Pitmaster's Secrets. You want a pork belly with the skin off, usually about 7-9 pounds for a whole side. 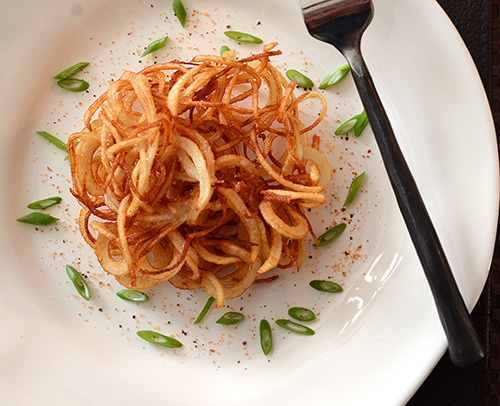 You won't find these at the grocery store, typically. Start by asking a local butcher. We've been lucky lately as Costco has been carrying them here in Knoxville. If you can only get skin on, you could always carefully remove the skin yourself and save that for making cracklin's. If you get a whole side of belly, I'd recommend cutting it in half across the middle which will make it easier to store while curing and it lets you try out two different recipes at the same time. John cuts his in thirds to fit into gallon zip bags for the cure and to fit his slicer. As noted, John did three recipe variations with one pork belly cut into thirds. First, we do wet cures, which makes it easier to get good coverage all over the pork belly. If you are doing a dry cure, even distribution is more paramount. John says the wet cures are better for us because they are more idiot proof (wait....what are you saying about us, John?). Mix the curing salt and other dry ingredients thoroughly, the pink salt needs to be well distributed. Be sure to follow the curing salt's guidelines for amount per pound of food, the ratios are critical for food safety of bacon. Then drizzle any wet ingredients to coat the belly. Obviously, the pork belly must be kept refrigerated for the curing time so you need to clear room in your fridge. The cure time is affected by thickness. For most bellies, a little over 1" in thickness, 7 days is usually enough. But if the belly is extra thick, you should go longer, about 10 days. You also need to use non-reactive containers, so we used glass 9 x 13" baking dishes and covered them with plastic wrap. John uses large zip top bags which makes the flipping easier and keeps the brine in contact with the whole slab. Flip the belly every two days, scooping up any liquid and drizzling it back over both sides before recovering the dish. You notice even though it's bagged, John keeps his in a container. Zip tops do fail occasionally and if it happens in your fridge, it makes a real mess to clean up. Better safe than sorry. Most recipes call for rinsing off the cure with cold running water. I was surprised at how little of the pepper came off when rinsing but I sprinkled some fresh pepper on just in case. If you prefer less salty foods, you can consider soaking the belly in a cold ice water bath for an hour or so to remove more of the salt/nitrite. I just rinsed all of mine, John soaked one of his. Both ways turned out fantastic. 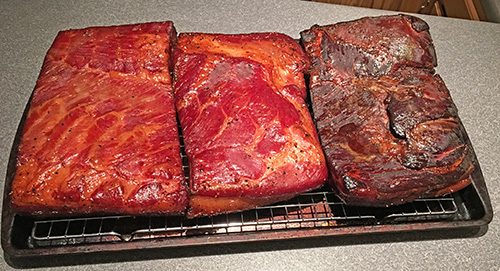 Most recipes call for air drying the pork belly in a refrigerator for a while after rinsing. This supposedly builds up a coating on the belly. 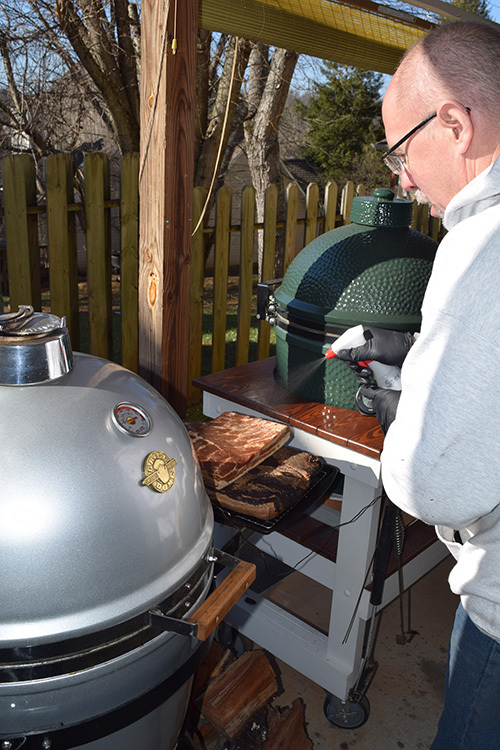 But as McGee points out, smoke vapors are deposited more efficiently on moist surfaces (176), my buddy Meathead endorses this technique, and it is a bit quicker, so I skip the air drying and head straight to the smoker. If you do air dry, make sure that all surfaces of the meat is exposed by putting it on a raised rack like this. 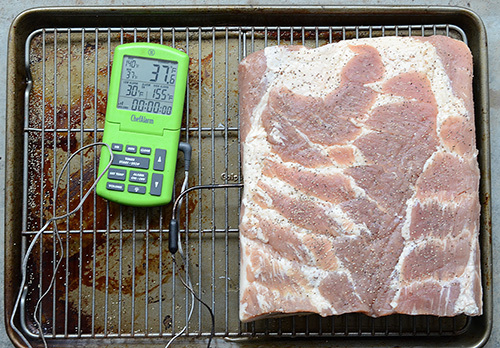 You want your pork belly cold when it goes on the smoker if you want to create more of a smoky flavor. 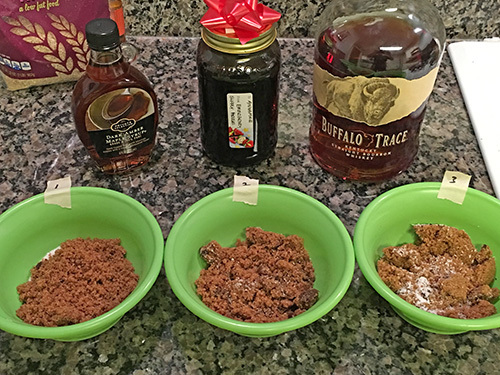 The section on the left was John's molasses bourbon and the two on the right, maple bourbon. We were slightly worried that the molasses one would come out super dark. 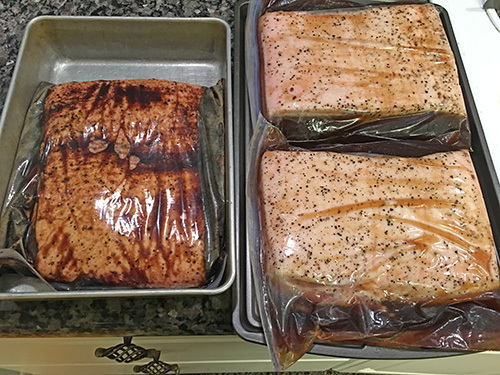 Here are a half pork belly of maple pepper and a half of bourbon maple. Heck if a moist surface attracts more smoke [actually helps the nitrogen compounds in smoke convert from nitrogen dioxide to nitrous acid to nitric oxide which gives smoke flavor and a smoke ring to meats (McGee 149)], let's take the opportunity to add flavor too! John and I have started spritzing with bacon with an apple juice and bourbon mixture (2:1 ratio). John spritzing his belly sections with an apple juice/bourbon mix (2:1). 8 - Smoke That Bacon! The short story is smoke the bacon at 200°f until it hits an internal temp of 155°f. Here's the long version. 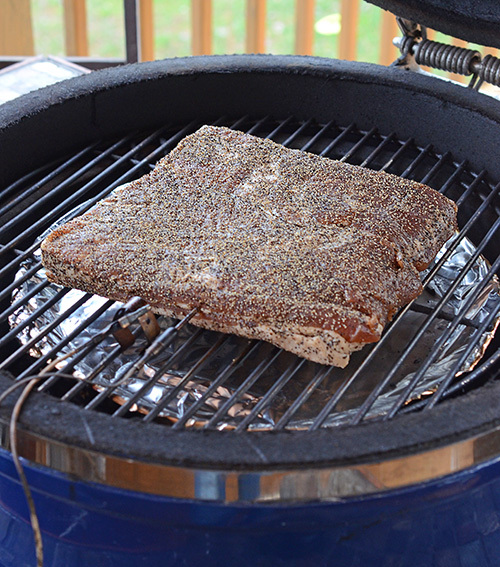 Smoking at 200°f can be a little tricky if you're used to cooking at dome temps of 250°f but a few tips make it easier. 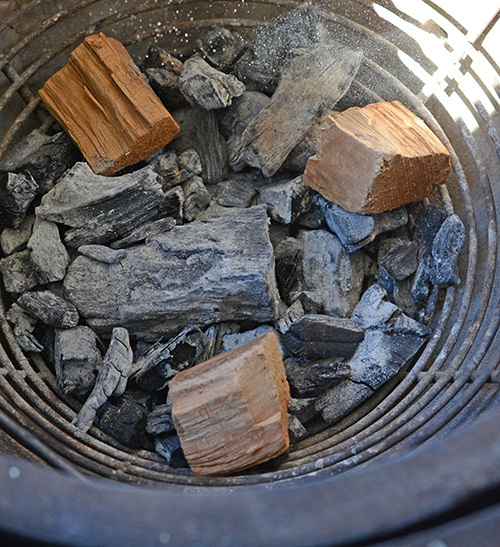 As always, cleaning out your fire bowl will make your fire come up to temp quicker and easier to control at steady temps. You are eliminating potential air flow issues. In his A Meat Smoking Manifesto, Aaron Franklin talks frequently about how air flow and currents are the key to good smokes. This is as true for kamado grills as it is the large metal pits he is using. For the same reason, John and I find using a Kick Ash Basket helps too. We have 4 of these and use them on all of our kamados at BBQ competitions. 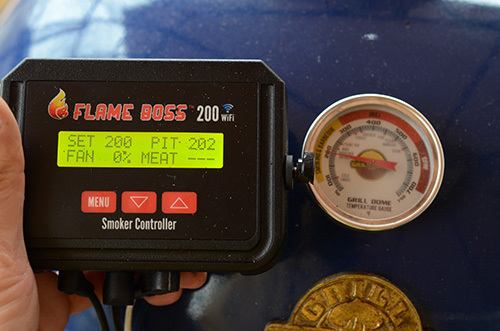 For the ultimate in temperature control, you can use a PID controller/blower like our Flame Boss 200. You can keep a 200°f fire using just the vents but the Flame Boss makes it soooo much easier. You can even check on your cooker and pork belly temps via wi-fi while doing your chores watching the game and enjoying a cold one. 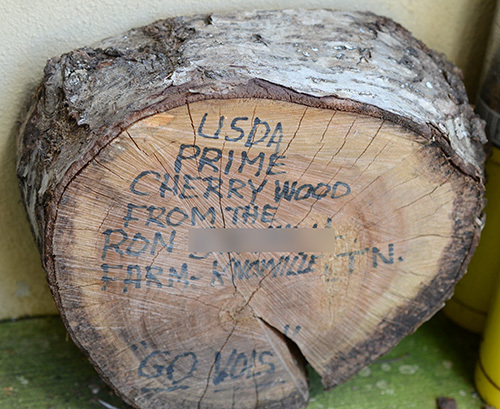 You'll want to fill your fire bowl up with lump and about 4 - 6 chunks of smoking wood. 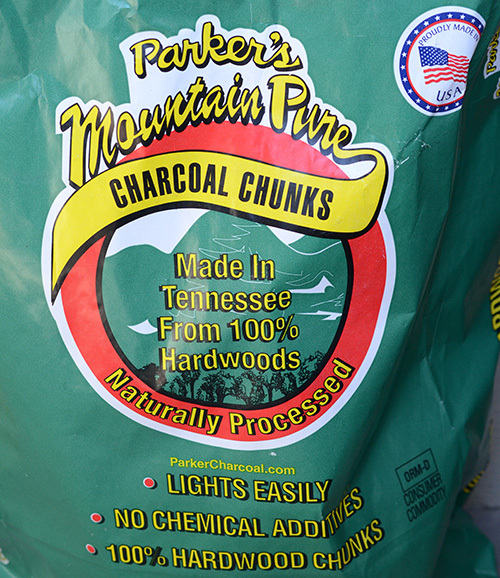 For the fuel, John and I both have been using Parker's lump because it's a good hardwood coal, sold at the same store where we get our ribs, and it's a Tennessee company. It starts quick and burns clean. 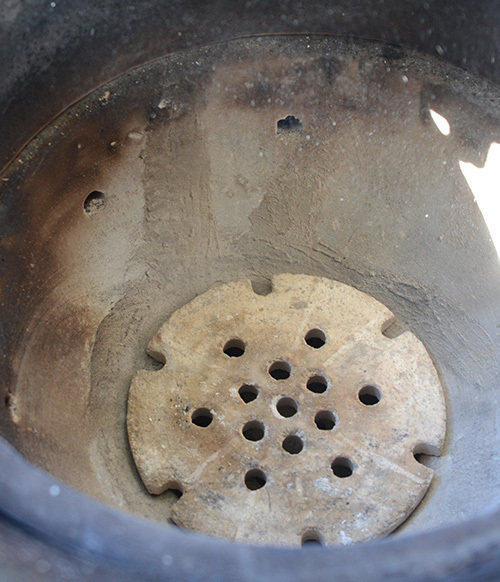 You need to set your kamado up for indirect heat. This can be using a spider/indirect rack, pizza stone, and drip pan like this. Set up for doing a 4.5 pound belly section on my Grill Dome, with the indirect rack, stone, and drip pan. Or using a plate setter like below. John prefers the plate setter because it protects more area from the direct heat below. 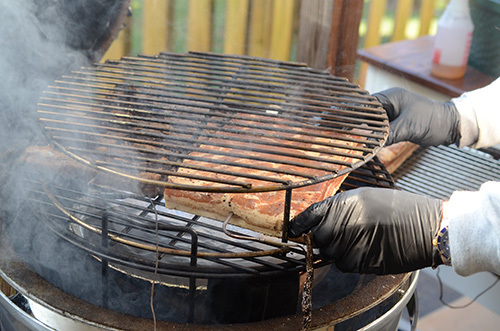 John using a Woo 2 with his plate setter and a raised grid on his Grill Dome so it can hold an entire pork belly. The rig is from Ceramic Grill Store but now I think they sell the Woo 3. 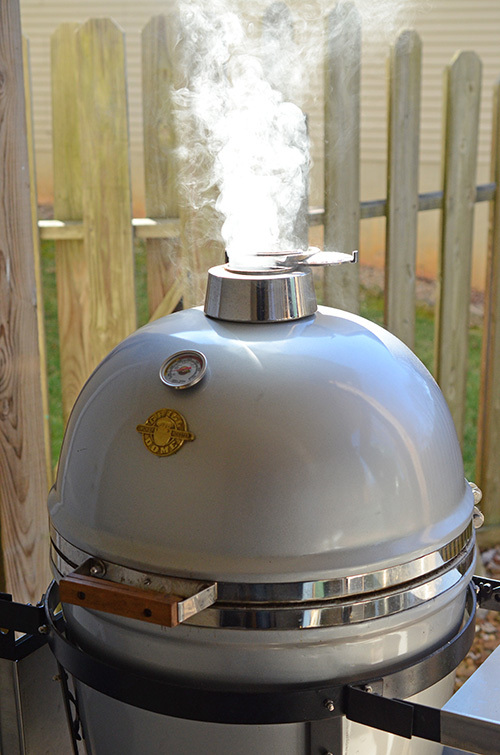 Then, just let it smoke until it hits an internal temperature of 155°f. 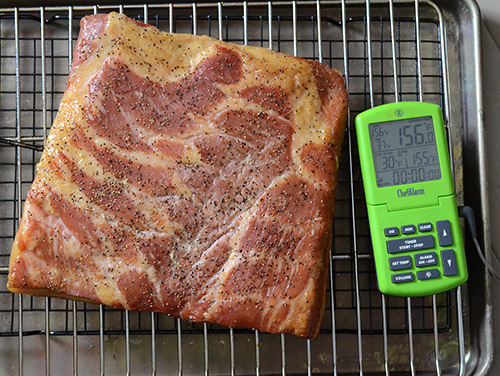 The amount of time is going to depend on how thick your pork belly is, not how much it weighs. For example, a 4 lb 2" thick piece of pork belly will take longer to cook than a 7 lb 1 1/2" thick piece. Typically it will take anywhere from 2 1/2 to 3 hours. But as with all cooks, times are just a guide, always go by the actual internal temperature. One of John's took 4 hours. Actually not smoking yet here, John is just getting his Grill Dome warmed up. Notice the temperature is about 100°f and the smoke isn't close to ready yet, it's too thick and heavy. 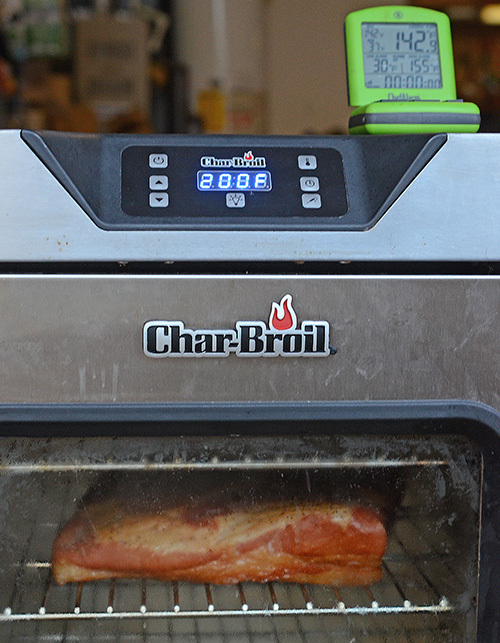 I smoked a maple - bourbon pork belly in my Char-Broil Deluxe Digital Electric Smoker. I've abused this thing, even using it as a makeshift holding cabinet when we vended at the Christmas parade, but it has held up. If you're the type of person who wants "set it/forget it" type smokers, electric might be the way to go. I'm a pyro so I like playing with fire. Once the bacon is done, I like to cool it down. You'll be tempted to slice it but that will be a hot mess. It will slice much easier and more cleanly once the fats harden, which takes 6-8 hours in the fridge. If I can withstand temptation, I actually like to vacuum seal it and let it mellow out in there for a few days. I do the same thing for smoked cheeses, it seams like it balances the smoke out evenly. 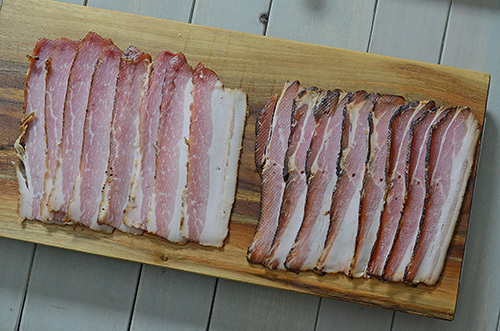 The color of your finished bacon will be determined by the recipe you use. 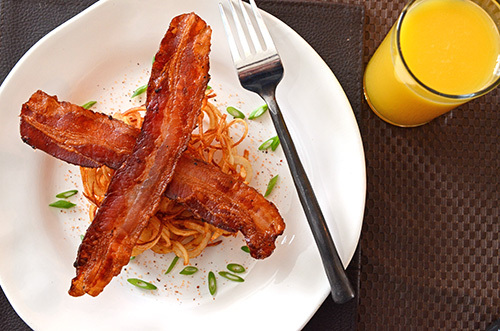 This maple bacon recipe was pretty light. The Maple Pepper Bacon was much darker. As you can see, the two maple bourbon ones (left) darkened up but the molasses one (right) actually lightened up a little bit so it didn't come out too dark. Once it has chilled, it's ready to slice. 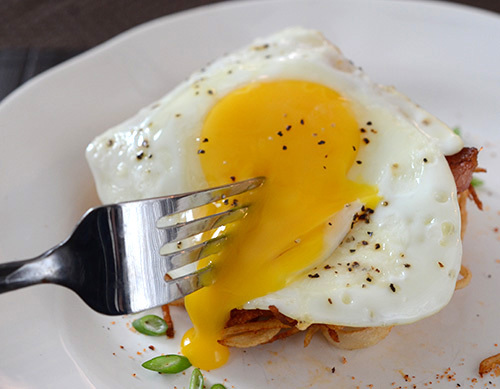 You can do it by hand or with an electric slicer. I like doing it by hand so I can do whole slices the whole width of the belly and I can feel what's going on with the meat as I slice it. I like the slightly thicker slices. I use a Victorinox 10" slicer knife, the same one I use for slicing briskets. I keep it razor sharp and use a steel before using it each time. Notice that regardless of how dark the outside gets, the inside stays about the same with a dark rind around the edges of each slice. John uses an electric slicer because he likes the thinner slices. Like most consumer grade electric slicers, his slicer doesn't accommodate the full width of a pork belly so he cuts his pork bellies to fit. After an overnight rest in the fridge, John also likes to stick the bellies in the freezer for 2 hours just before slicing to make it easier. 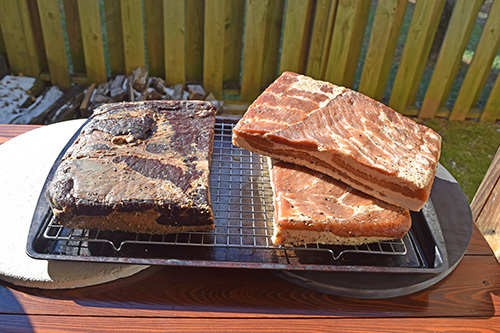 John's bourbon maple bacon on the left, molasses bacon on the right. Both were excellent tasting. Another good argument for using an electric slicer is that this is a lot to slice by hand and carpal tunnel surgery is expensive. 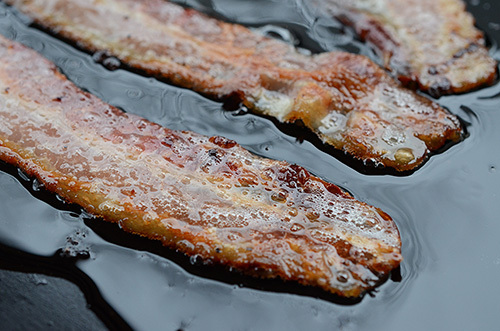 Homemade bacon wasn't treated like commercial bacon and it doesn't cook up the same way either. First time I ever got some superior quality bacon (Benton's actually), I burned the hell out of it cooked it extra crispy because I tried to cook it like regular bacon. You need to cook it at lower temps. Same goes with homemade bacon. 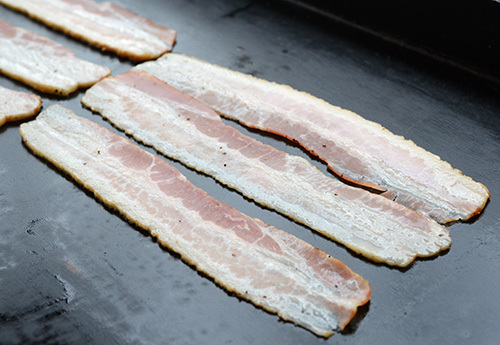 As with all bacon, starting with cold bacon on a cold cooking surface will render the fat better. Another noticeable difference is that the bacon grease from home cured bacon is extremely clear. It would be an absolute crime not to save this bacon fat for cooking later. 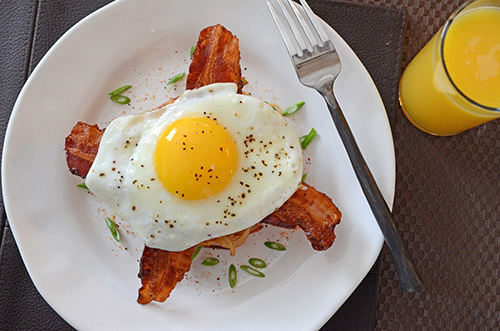 So what to do with all of that delicious bacon? Both of our families have been eating the heck out of it. A few weekends ago, we made these. Then it all mixes together....oh yeah! Sorry if you're one of those people who can't have their foods touch each other. So that's where we are with makin' bacon. If you haven't tried it, I highly recommend giving it a shot. If you have, what are your experiences? [FTC Standard Disclaimer] I received no compensation for this post. We did receive the Grill Domes and Char-Broil Digital Electric Smoker as part of our 2015 sponsorships. We have great personal relationships with Flame Boss, Thermoworks, and Kick Ash Basket but we also buy products from them. I paid full price for the books and knife that I mentioned.